A feral man who says that he has never left the woods has been found near a small settlement in Siberia. The 20 year-old was brought up by hermit parents, who then reportedly abandoned him. “He has got no education, doesn’t have any social skills and has no conception of the world outside of the woods,” said Roman Fomin, a prosecutor in the town of Belokuriha in the Altay region. The man said that his parents told him that he was born in 1993, and took him to the forest when he was four. In May of this year, the couple, whose names have not been published in the media, reportedly abandoned him. Police say they are searching for the adults, who were reported by locals to have departed for the island of Sakhalin, off Russia’s Pacific Coast. A local woman discovered the feral man living in a hut in the ground, 3 kilometers from the nearest human settlement, and escorted him to the police department. The man, who looks no older than about fifteen, has never been observed by a doctor, and was not registered at birth, and therefore is not currently eligible for medical or social aid. Police say that he is capable of delayed but clear speech. Fomin said that the parents were unlikely to face charges. “They only have criminal responsibility if some harm has been done to their child. The most obvious charge could be neglect or abuse, but we have no evidence of this,” said the prosecutor, adding that any case was complicated by the fact that the foundling is legally an adult, at least according to his own words. With its vast, often inaccessible landmass, sparse population, and inconsistent social service coverage, Russian media stories about feral children are not unusual. 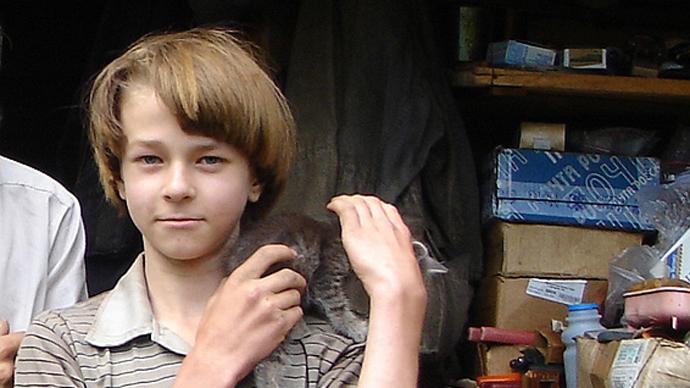 Six year-old Ivan Mishukov was spotted among a pack of stray dogs, who accepted him as their leader, when social services found him back in 1998. Mishukov had escaped from an abusive parent, and later joined the Navy cadet corps. In 2007, there were reports of Alesha, a child raised by wolves, who communicated by barking, howling and biting, and escaped from the police. A year later, social services found “bird boy”. The 8 year-old who had been abused by an ornithologically-obsessed mother, who raised him as one of dozens of pets in a small apartment block, spoke only in chirps. Follow up stories on the rehabilitation of such children are rare, once the initial sensationalist coverage dies down, though psychologists generally agree that full recovery is unlikely if too many developmental targets were missed in very early childhood. While the Siberian feral man is at least capable of speech, he faces a different problem. Like many of those living in isolation for extended periods of time, the boy likely has an immune system that is not adapted to most common diseases. The Lykins, a hermit family that became nationwide celebrities after being discovered in the late 1970s following decades of isolation, quickly perished from pneumonia and other contagious diseases, once reporters began paying visits to their isolated homestead. Local media say that for the moment the ‘Altay Mowgli’ continues to live in the forest, and has begun gathering firewood ahead of winter.